Editions Michel de Maule, Paris 2005. Transcription, translation and piano accompaniment by Alain Daniélou. Tagore treated Daniélou as a close friend, inviting him several times to stay at his school at Shantiniketan, where he offered him a post as director of the musical department. 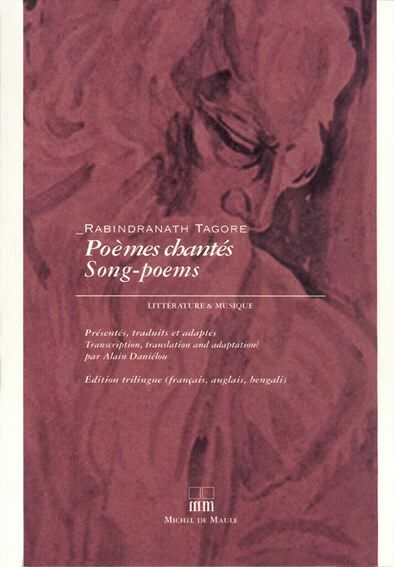 It was the Poet’s wish that Daniélou should translate Tagore’s compositions in Bengali into French and English, and compose the related score for voice and piano. that is, belonging to the past _, while his songs, sung by everyone in every part of Bengal, belong to the eternal present. During the nineteenth century, Indian classical music in Bengal developed in many ways an over-refined technique, performed only by highly trained specialists and fully appreciated only by a select audience. The musical form from created by Tagore maintains the essential features of the classical Indian system of music, but brings its rare power of expression within reach of all. Tagore was always deeply moved by the human predicament. His songs, with their simple but vigorous melodies, have given voice, expression, to the feelings of millions of men and women. These songs can be heard everywhere, in wealthy city home, in lonely rice fields, on the rivers or in the fishermen’s huts, in the village street or the university hall. Their ringing words know no difference of creed, race, caste or age. Within a few years, Tagore’s music conquered the whole of Bengal and still pervades the rhythms of everyday life with ever-cherished melodies. Today, Hindu India and Muslim Bangladesh have both chosen songs by Tagore as their national anthems.